A summer breeze blows a cloud of dust through the Spanish town of Sesena. Drifting along the empty streets and deserted playgrounds the eerie silence is occasionally broken by the slow creaking of an unused swing. Like the housing market right now, little is moving in Sesena. Boom has turned to bust and the wider Spanish economy is suffering. Lying just 20 miles south of Madrid, Sesena was designed as a major urbanisation for professionals who could not afford city prices. But there are few signs of life at Sesena, now dubbed the Spanish ghost town. The population of this town did not disappear, they simply never arrived. More than 13,500 apartments were built on this area of scrubland. But less than 3,000 have been sold. So far the number of people living in Sesena can be counted in the hundreds. Developers are desperate to get people to move into the apartments and are slashing prices. Monica Torremocha Orocco is one of few who is interested in moving into the area. She says that rents there have fallen by more than 400 euros in a month. "They've cut the prices of flats a lot because people don't have any money. You could say we are in poverty here," Ms Orocco adds. Sesena is just the tip of the iceberg. Down on Spain's southern coastline, the signs of overdevelopment are plain to see. Cranes and apartment blocks under construction dominate the horizon. In many tourist communities on the Costa Del Sol, Britons and Spaniards have scrambled to snap up their dream holiday homes. But today many of the flats remain empty and developments unfinished. Developers have gone bust and people who have put down deposits have struggled to get their money back. 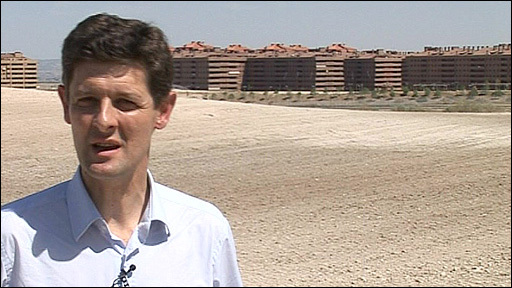 David Busby, from Lancashire, bought a property on the outskirts of Marbella six years ago. Bought off the plans it took more than four years to complete and now he is struggling to find a tenant. What was once his dream retirement home is now his Spanish nightmare. "We were looking for an investment for our retirement, but so far we've lost £90,000," says Mr Busby. Inez Rix, from Direct Auctions, says David Busby's situation is not unusual. His property will be hard to sell because there are simply too many others like it on the market. "That's been the problem, too much supply." In recent years Spain has built more houses than the UK, France and Germany put together. The construction industry has accounted for a fifth of all jobs created in Spain since 2000. Its downturn is now having a significant impact on the economy. Some experts say that holiday developments are worse affected than residential properties in urban areas. But nobody can deny that this is a market in trouble.